A knowledge of customer preferences, as well as an active Twitter feed, are key to getting their business. Consumers patronize food trucks mostly for grab-and-go items, and Mexican handhelds lead in popularity. 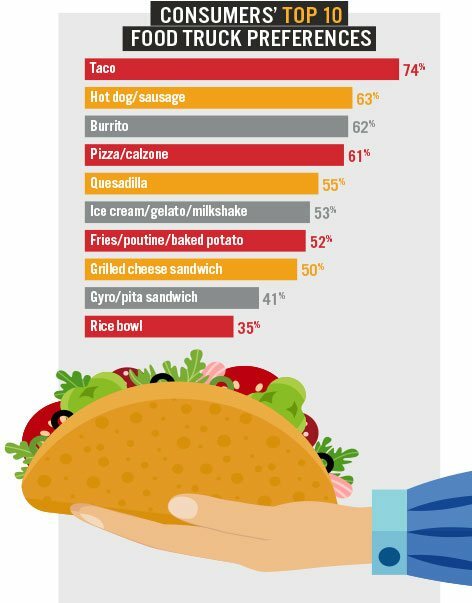 Tacos are the number one choice for all age groups, with 74% of consumers overall opting to purchase these from a truck. Burritos and quesadillas are also favorites, with 62% and 55% of consumers, respectively, saying they’d consider ordering these items at a food truck. But for food truck patrons who crave something other than Mexican, top choices include pizza, hot dogs, grilled cheese sandwiches, ice cream and gyros. Nine of the top 10 most craveable food truck foods traditionally include dairy either as a main ingredient or a topping/side. What’s more, 69% of consumers agree that cheese adds value to street foods, and 49% would be willing to pay more for a food truck menu item with cheese. Additionally, 24% of customers would be more willing to purchase items with yogurt-based sauces and condiments, and ice cream treats are a big draw. 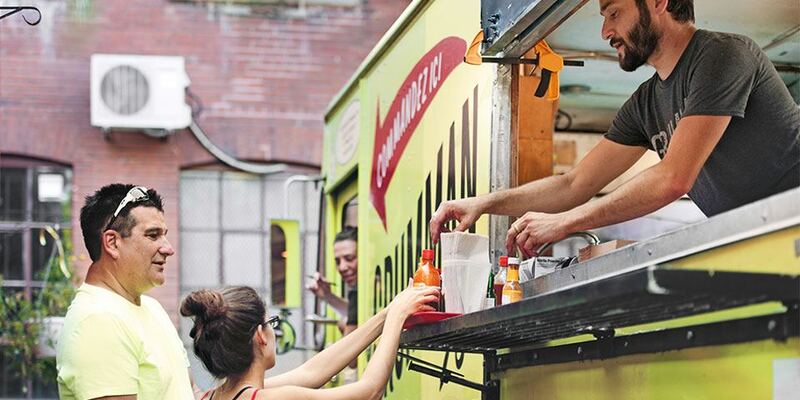 Here are four ways food truck operators are cashing in on that thinking. Overall, 71% of consumers agree that authenticity is a key factor in selecting street foods. For example, many trucks offering Mexican fare are using Hispanic cheeses, such as cotija, queso fresco and panela, to promote authenticity. Authentic Northern Italian-style pizzas are a differentiator for Company 77, a mobile Southern California-based pizza concept. Pizzas are baked in a stone deck oven mounted in a retrofitted fire truck. Tacos were one of the items that jump-started the food truck movement, and taco trucks are still a major force. Poco Loco, a taco truck that drives around Providence, R.I., has built a following by giving consumers the ability to customize this Mexican street food, choosing a meat or veggie filling and building the taco with toppings including cheddar and jack cheeses, sour cream or crema, salsa, onions, lettuce and more. Customization is critical to reaching the Gen Z population, per Technomic’s Generational Consumer Trend Report, and that’s the demographic that dominates the college scene now and will soon be out in the workforce. Other food truck fare that can be customized includes rice bowls, loaded fries and crepes, to name a few. Some 69% of consumers are attracted to street foods with unique flavors. And unique pairings and sauces impact the purchasing decisions of 62% of consumers. The Original Grilled Cheese Truck, a concept founded by a chef in Los Angeles, offers signature sandwiches made with flavorful cheeses and nontraditional pairings that have become fan favorites. Dairy plays a big part in food truck sweets. Ice cream, gelato and milkshakes are treats consumers crave, and trucks are delivering on this demand. Ice cream mentions in food truck desserts are up 10.7% year over year, according to Technomic’s MenuMonitor. * And they’re not offering the packaged bars or soft-serve cones of the past. Premium ingredients, unique flavors and creative applications characterize these treats, such as the shakes offered at Beavers Coffee & Donuts, a Chicago food truck. Lunch remains the busiest daypart for food trucks, but people are also patronizing these mobile restaurants for other dining occasions. Fifty-six percent of respondents agree that they are more likely to consume street foods as a snack rather than a meal. Food truck operators are seizing this opportunity by offering craveable snacks and sides to boost lunch checks and traffic at off times. Here are three ways we’re seeing this play out at food trucks. Kimcheesy Rice Balls are a global mashup at the Yum Dum Truck in Chicago. The crispy snacks or sides are made with cheddar jack cheese, house kimchi, jalapeños and scallions, topped with Sriracha mayo and cilantro. Cheesy Tots make for an indulgent side or snack at The Grilled Cheeserie in Nashville. In the style of poutine, potato tots are smothered with cheese, and customers can opt to add bacon and smoked jalapeño relish, each for 50 cents extra. Argentinean empanadas are sized for snacking at Chicago’s 5411 Empanadas truck. Filling variations include mushroom, thyme and blue cheese, and bacon, cheddar and egg.